"Savory and tasty, a great recipe to make. Just throw everything in the slow cooker on your way out the door in the morning, and a delicious soup will greet you on your return. The whole family will like this down to home soup." 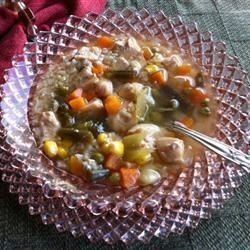 Combine celery, chicken pieces, chicken broth, water, mixed vegetables, rice, parsley and herb seasoning in a slow cooker. Cover, and cook on low 6 to 8 hours. If soup is too thick, add more water to dilute and allow 15 minutes of additional cooking time. Good. But when preparing, I would cut back on the lemon seasoning. Also, for an interesting twist, used flavored chicken broth. I threw all the ingredients in my slow cooker before I left for work. However, when my husband got home less than 5 hours later, the rice was nothing but mush. I don't recommend this recipe. GREAT RECIPE! FAMILY ASKED FOR MORE. NEXT TIME I WILL TRY ADDING RICE 1 1/2 HOURS BEFORE FINISHED SO THAT RICE DOESN'T TURN MUSHY.